You can pinpoint the Internet’s political awakening to a single day. On Jan. 18, 2012, more than 100,000 websites took part in the blackout against the now-infamous Stop Online Piracy Act, better known as SOPA. The mock-censorship campaign inspired at least 4 million people to contact their members of Congress, voters who told their representatives to oppose the anti-piracy legislation that experts said would break the Internet and endanger civil liberties online. Within hours, the bill’s list of supporters in Congress plummeted. Two days later, SOPA officially died. The Internet, miraculously, had won. 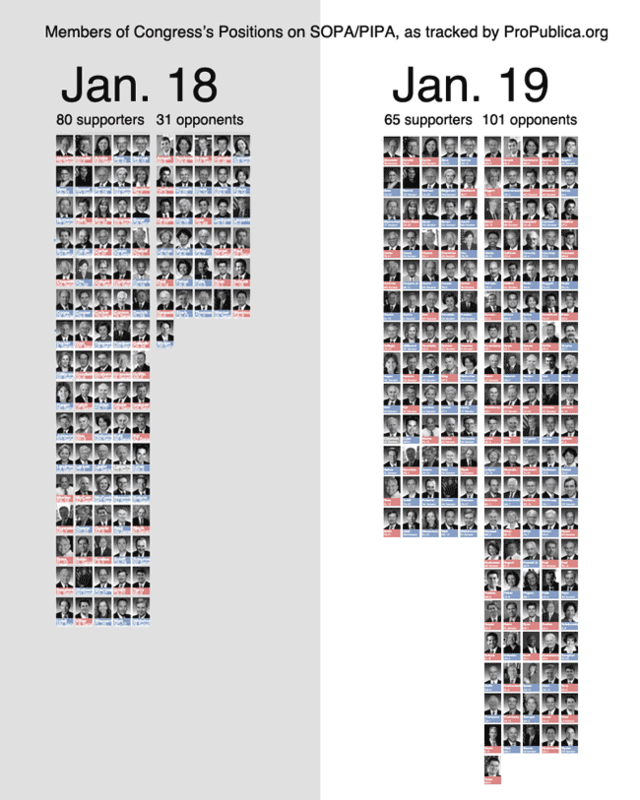 The successful stoppage of SOPA sparked a new era of political activity on the Web. From that point forward, activism against every issue that might negatively affect the Internet, from the controversial Cyber Intelligence Sharing and Protection Act (CISPA) to the secretive Trans-Pacific Partnership (TPP), has mirrored the SOPA strategy. Just last month, the Internet Slowdown Day campaign, organized by many SOPA blackout veterans, pushed net neutrality—the concept that all data should be treated equally, which is now under debate by the Federal Communications Commission (FCC)—to become the most-commented issue in the history of the Commission (trumping, mercifully, public outrage over Janet Jackson’s Super Bowl “wardrobe malfunction”). Internet activists are not the only ones who took heed of Web users’ new found ability to kill legislation they dislike. Following the 2012 protest, the phrase “Don’t get SOPA’d” reportedly became a warning mantra on Capitol Hill. When Rep. Mike Rogers (R-Mich.) began pushing CISPA through the House in April of that year, he and his Democratic co-sponsor, Rep. Dutch Ruppersberger (D-Md.) called me and other reporters who covered the SOPA debacle just to reassure us that “CISPA is not SOPA.” In the months that followed, CISPA died (twice) due to privacy concerns and a veto threat from President Obama. The Internet’s reactionary activism is simply not enough. We must be proactive. We must think long-term. On all fronts, SOPA proved that Internet users, as a single constituency, can transform into a political force of nature. When storms of discontent brew over Washington’s plans to mess with the ‘Net, lightning is sure to strike. And yet, the Internet is still vulnerable. We may have bombarded the FCC with comments in support of net neutrality, but there is no guarantee the commissioners will listen. The TPP is still trudging along in the shadows. And, as Jesselyn Radack, attorney to whistleblowers Edward Snowden and Thomas Drake, points out, Congress has still, more than a year and a half after Snowden first entered the world’s consciousness, failed to reign in National Security Agency (NSA) spying, despite a constant public outcry against mass government surveillance. In other words, the Internet’s reactionary activism is simply not enough. We must be proactive. We must think long-term. That means ensuring that the halls of Congress are lined with representatives who deeply understand the issues we, the Internet, care about most: privacy protections, balanced cybersecurity measures, reasonable copyright reform, an overhaul of outdated computer crime laws, and a free and open Internet. And we must guarantee as best we can that they have the Internet’s best interests in mind each time they climb the U.S. Capitol stairs to introduce a bill or cast a vote that affects our digital world. With this in mind, The Kernel’s politics team has composed the comprehensive Internet voter’s guide to the 2014 midterm elections. It is a list of incumbents, like Rep. Jared Polis (D-Co.)—the subject of this week’s Me IRL interview series—who have proven themselves reliable defenders of the Internet. It also includes newcomers who stand a better chance of protecting the Internet than their challengers, members of Congress who have consistently opposed the interests and values of Internet freedom. If you care about the health of the Internet more than any other topic, our guide will tell you how to vote come Nov. 4. The rest of this week’s Kernel issue turns the focus on the Internet itself. We explore how Facebook’s algorithm-driven News Feed dilutes vital political journalism. And we investigate the blossoming world of Twitterbots, some of which serve as automated watchdogs that help keep our politicians honest , while others lended their soulless opinions about the upcoming election, to humorous effect. We look at YouTube as a voter-outreach tool, and the coming fight over the right to encrypt our data. As that fateful first Tuesday in November nears, remember this: The Internet is young. It is fragile. It is as moldable as it is ubiquitous. Just as America’s democracy is ultimately a reflection of its people, so to is this digital democracy on which we so heavily rely. We are the Internet, and the Internet is our future.